Moving To Midcoast Maine? Here’s What You Should Know! Many people who contact our Brunswick, Maine real estate agency do so because they are considering moving to Maine from another state. Like any state, Maine is very unique, especially the Midcoast region our real estate agency serves. Our area is full of quaint little towns, rural farm homes, historic buildings, and rocky shores as far as the eye can see. If you’re thinking about moving to Midcoast Maine, we’d be happy to call you our neighbor! Below, we’ve listed just a few things you should know about this area before you contact your Maine realtor looking for homes for sale in Brunswick, Freeport, or any other area we serve. They weren’t kidding about the lobster. What’s the first thing that comes to your mind when you think of Maine? If you’re like a lot of people, it’s probably lobster. It is an incorrect stereotype that Mainers live off of lobster. However, that doesn’t mean they don’t have the option to! From lobster rolls to sushi rolls to macaroni and cheese to omelets, there’s no wrong way, time, or place to enjoy lobster in Maine. If you truly cannot handle snow in any capacity, Maine is not the place for you. However, if you love snow, or you can at least tolerate it, then dealing with a cold, snowy winter is well worth it for the breathtaking spring, summer, and fall seasons. Because of our coastal location, winters are wet and snowy, but it is rare for a cold spell to last longer than a few days. Most of the horror stories you hear about Maine winters come from inland Maine where they get pounded with snow without much reprieve. The cities in Midcoast Maine are accustomed to heavy snow, so the roads often stay pretty clear and driveable. We don’t mean to harp on the snow. The cold weather chases out tourists and leaves towns quiet and full of snowy charm. It is the perfect time to hit the mountains for a weekend of skiing, take the kids sledding, or go snowshoeing through our beautiful landscape. Your friends and family will want to visit you. When searching for homes for sale in Midcoast Maine, you might want to think of buying a home with a spare bedroom. While many non-Mainers will harp on how bad the winter is “out there,” they’ll be begging to come visit by the time summer is here and sailboats are leisurely taking off from the port or when fall rolls around the landscape explodes in brilliant yellows and reds. There’s something here for everybody. If you are a young professional looking for work, Portland is just a short drive from beautiful Midcoast Maine. If you’re a family looking for a safe neighborhood to watch your children grow up, you can’t go wrong anywhere in our area. If you’re a retiree looking for a quiet life in the country, we’ve got you covered. Best of all, no matter which category you fall into, you’re never far away from anything you want or need. Local eateries are scattered throughout our beautiful and charming towns, as well as all of the chain retailers you need to live comfortably. We have great healthcare, amazing parks and conservation areas, beautiful beaches where you can spend long summer days, and so much more. 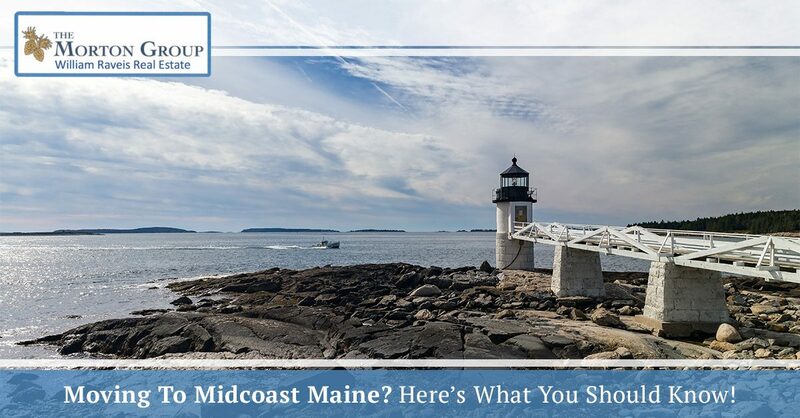 Want To Learn More About Living In Midcoast Maine? Give Us A Call! We will continue to post tidbits about life in our neck of the woods on our blog, but if you’re looking for homes for sale in Maine, make sure to give our Brunswick Maine real estate agency a call. We are happy to serve a wide area of Midcoast Maine, including Brunswick, Freeport, Topsham, Richmond, Bath, and more!